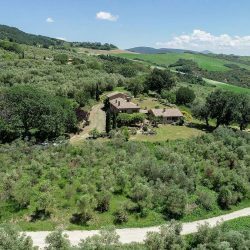 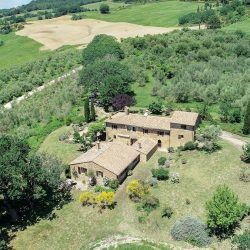 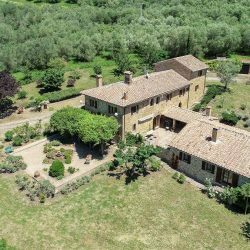 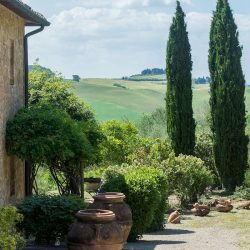 In the Val d'Orcia near Pienza, impressive restored 4 bedroom farmhouse and 3 bedroom cottage in a hectare of land with 225 olive trees. 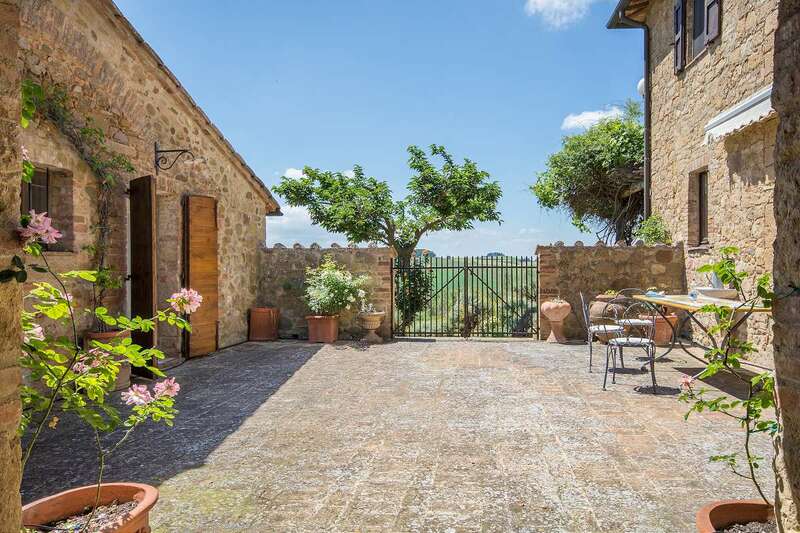 Pienza Property. 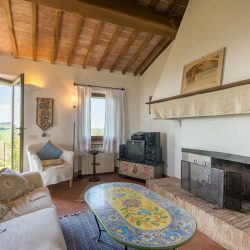 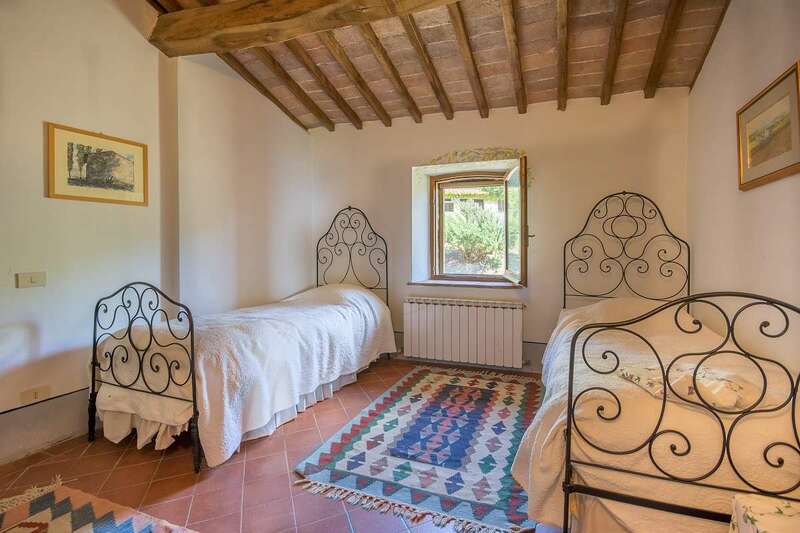 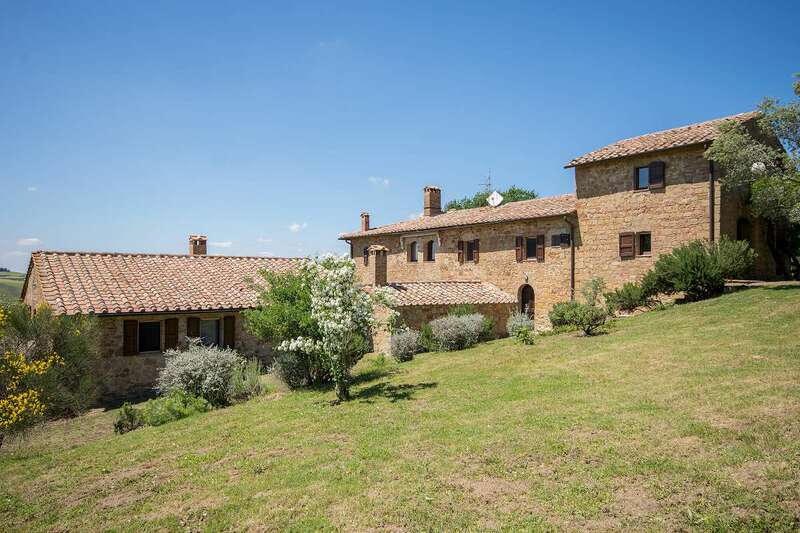 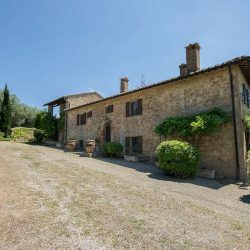 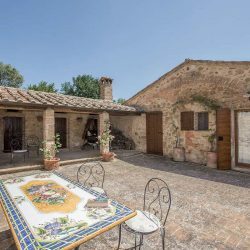 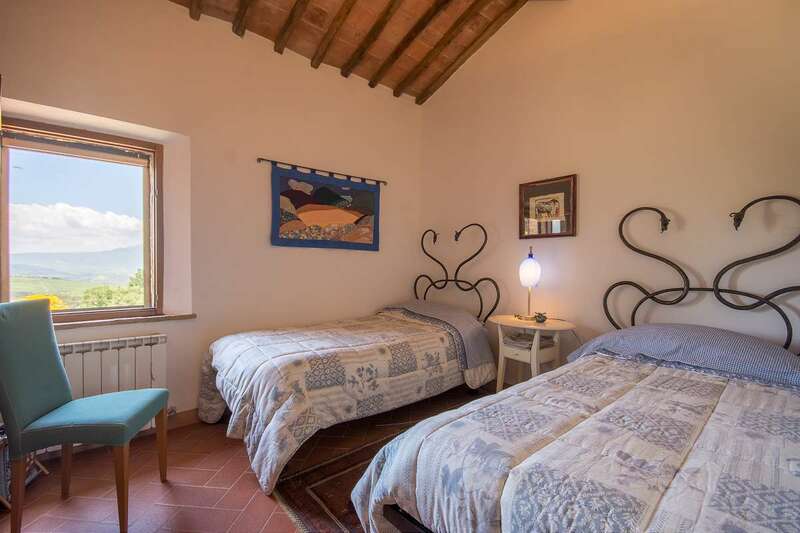 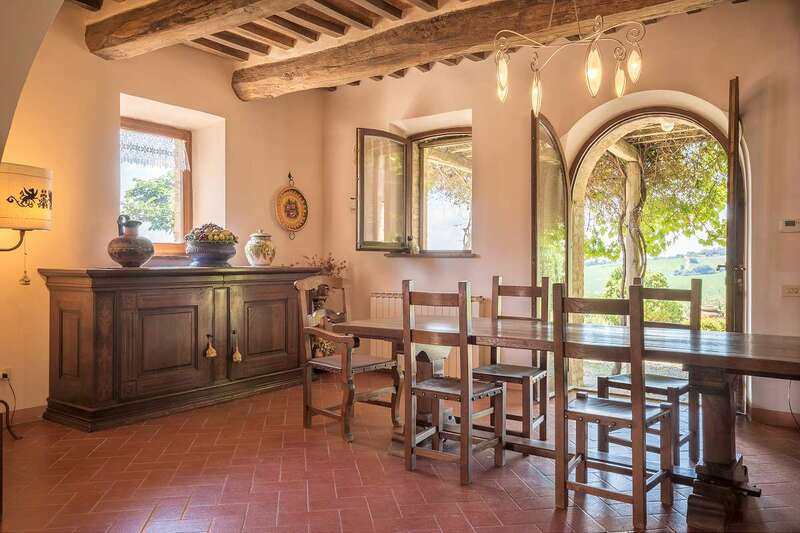 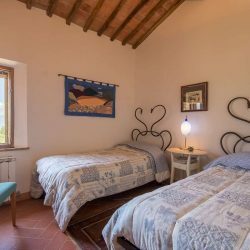 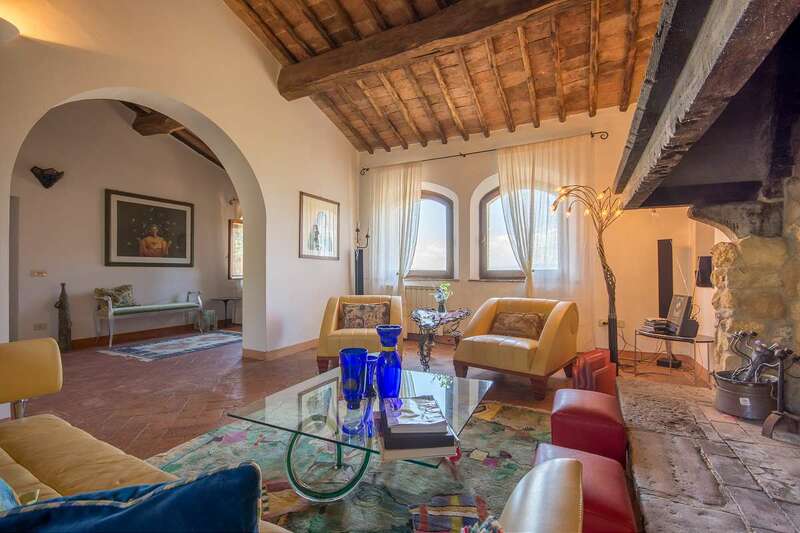 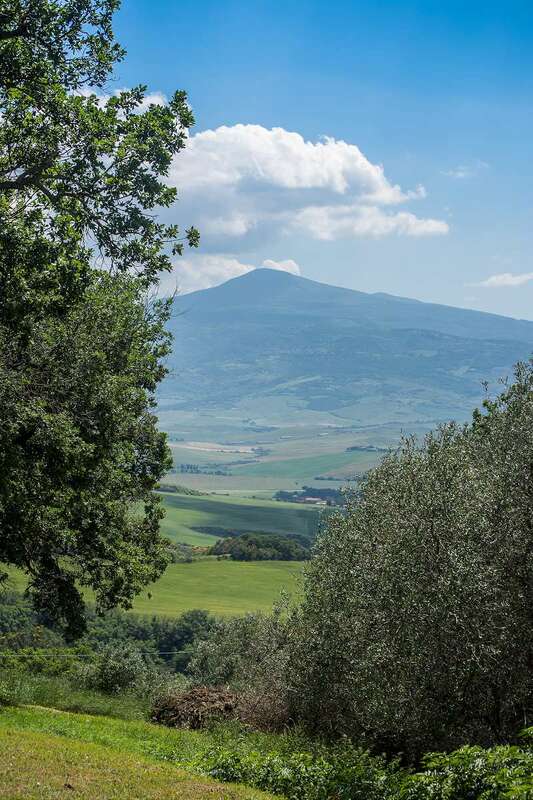 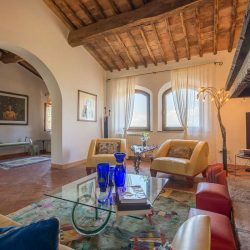 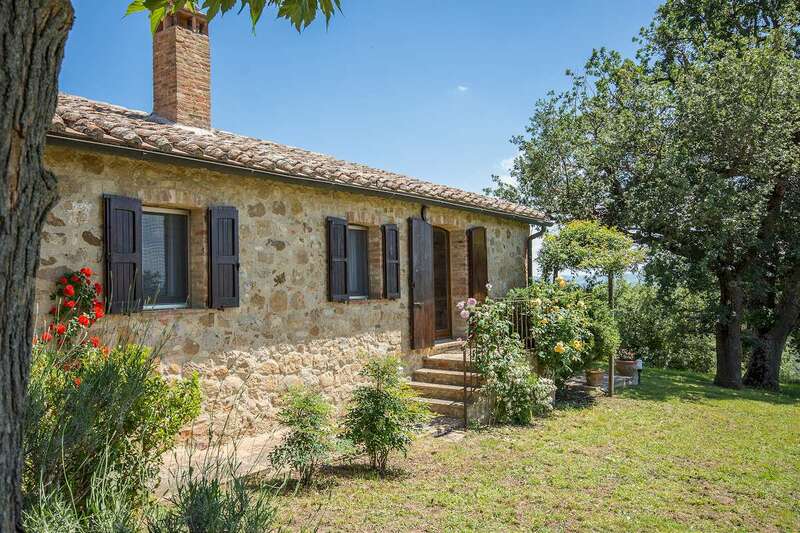 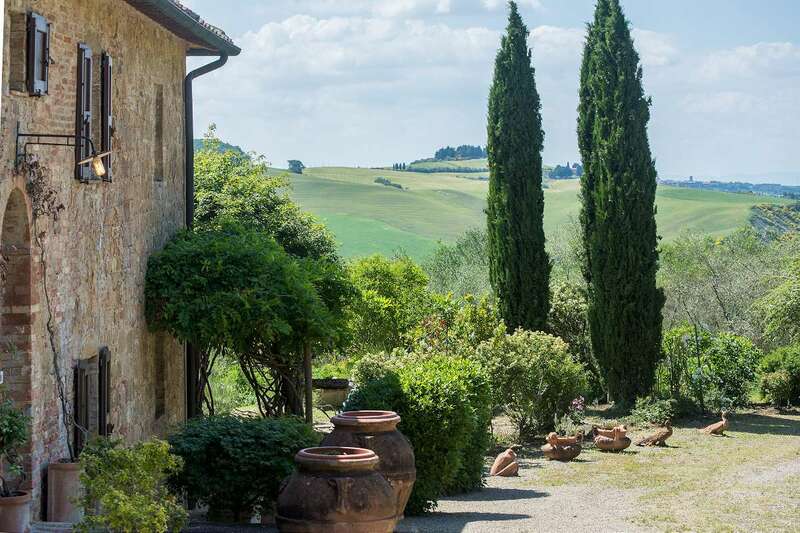 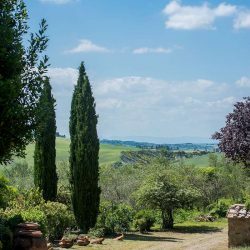 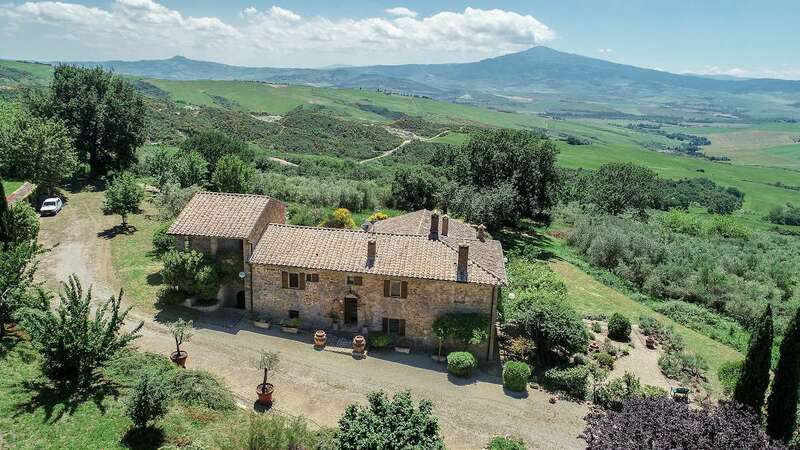 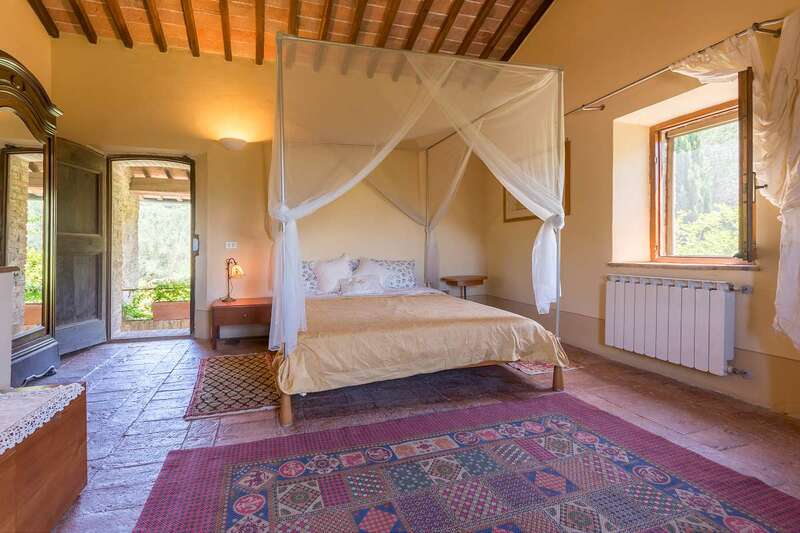 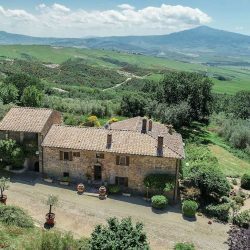 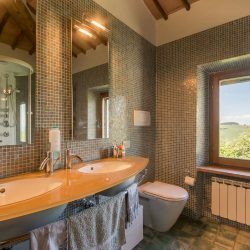 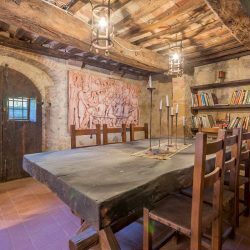 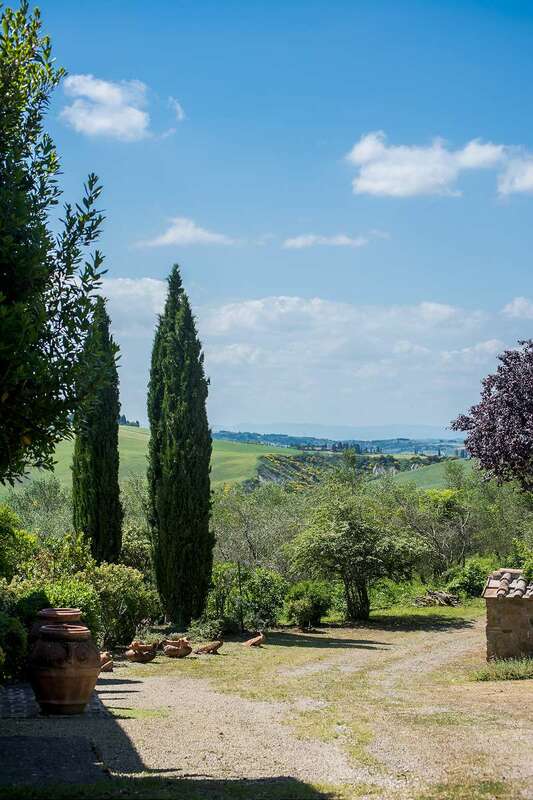 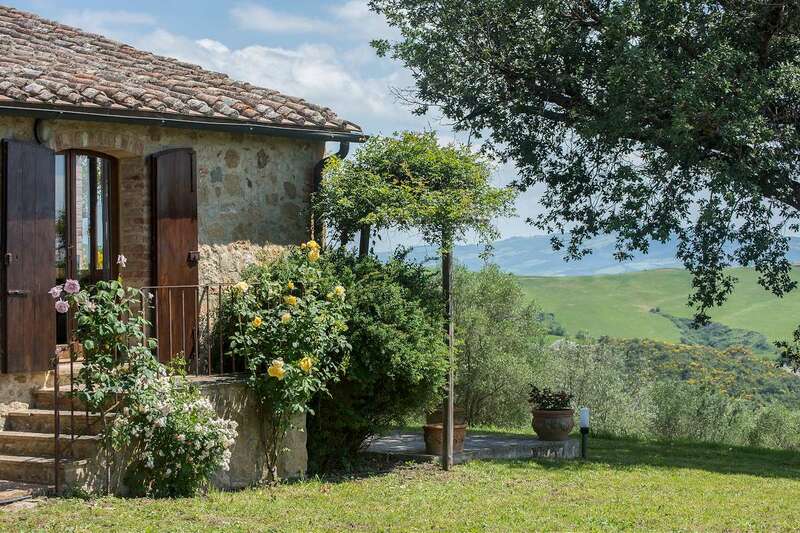 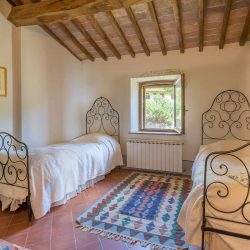 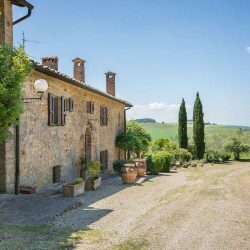 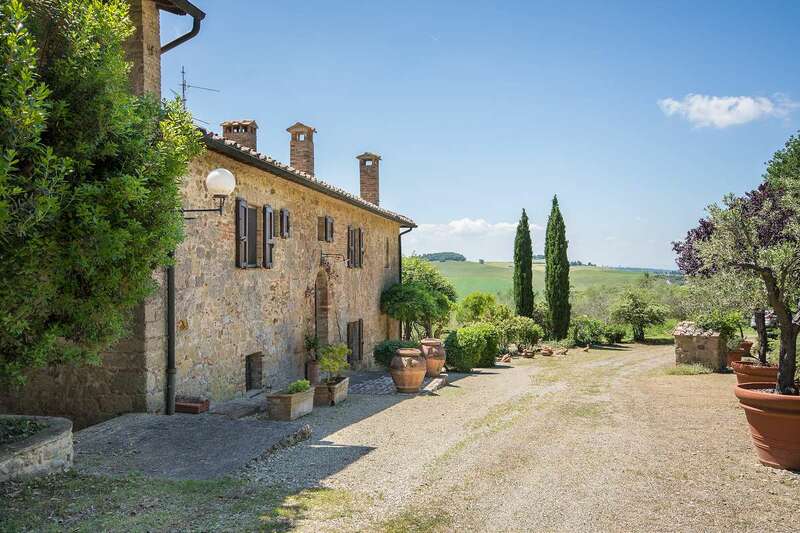 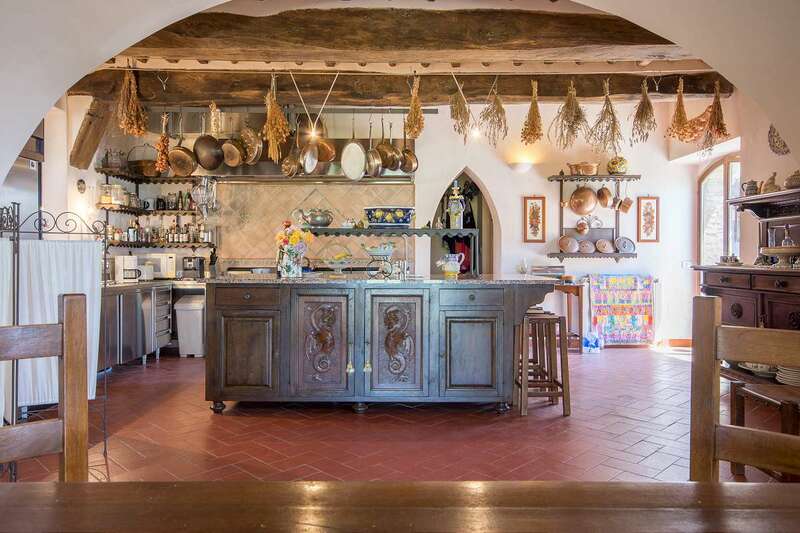 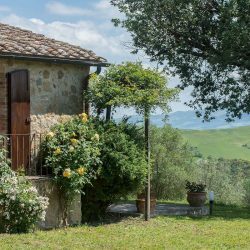 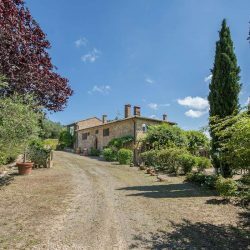 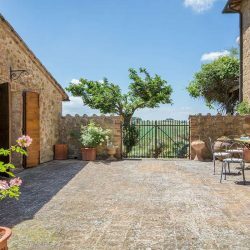 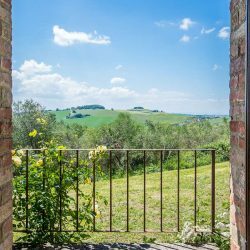 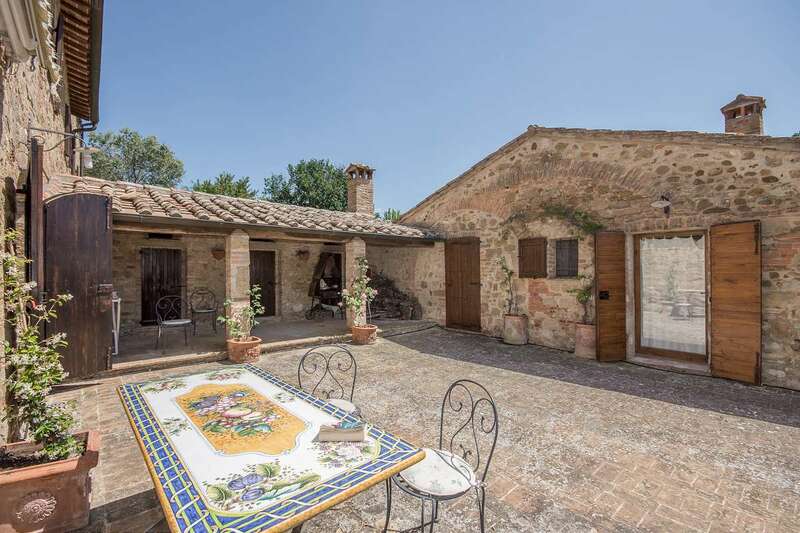 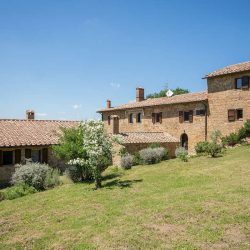 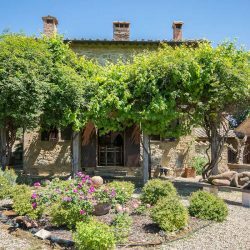 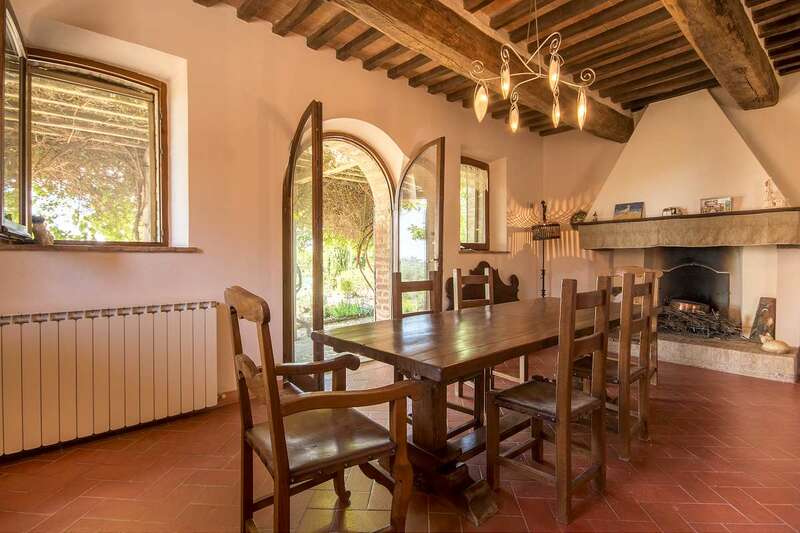 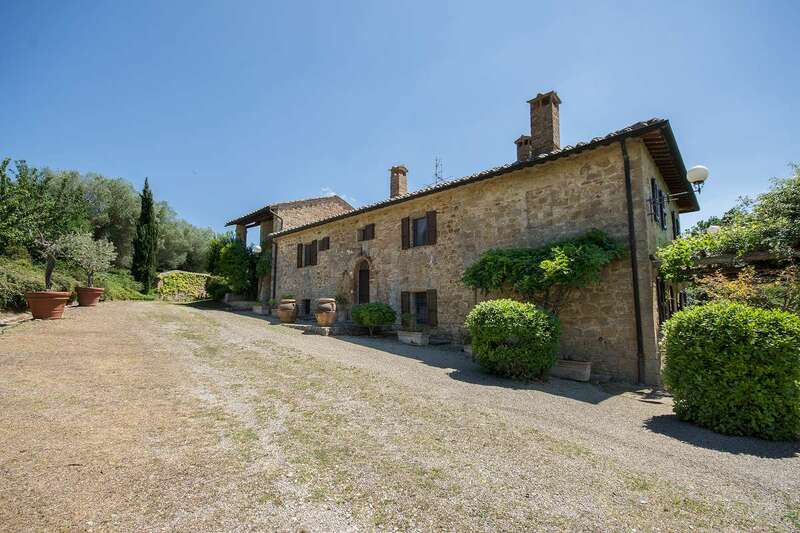 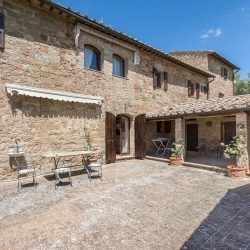 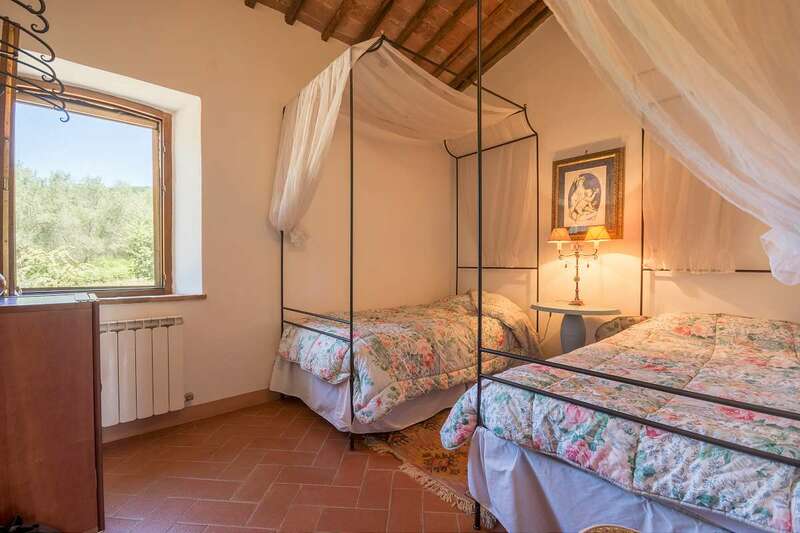 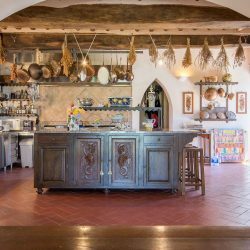 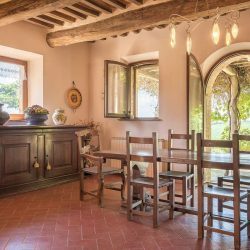 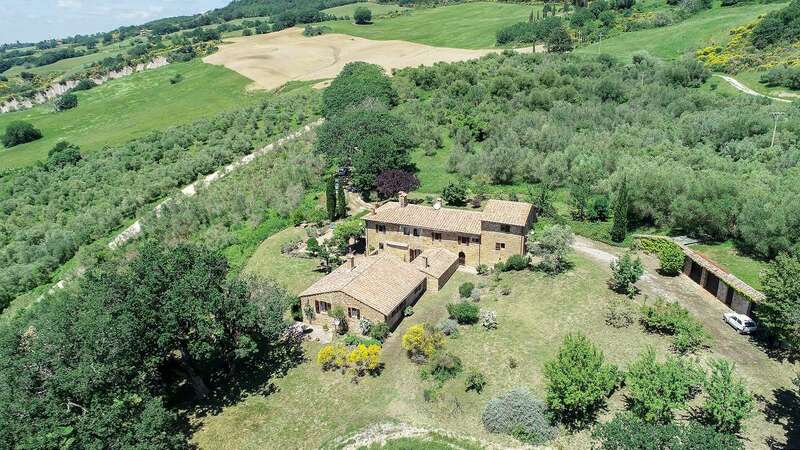 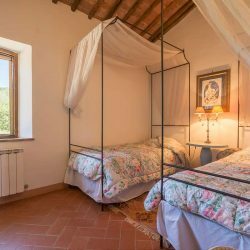 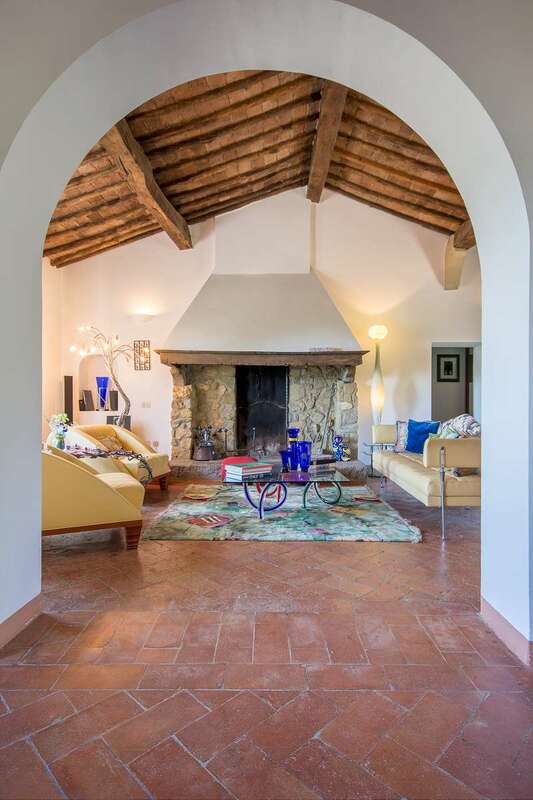 This restored farmhouse is located in total privacy near Pienza within easy reach to the villages and attractions of the beautiful Val d’Orcia. 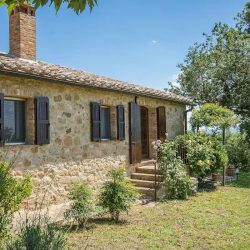 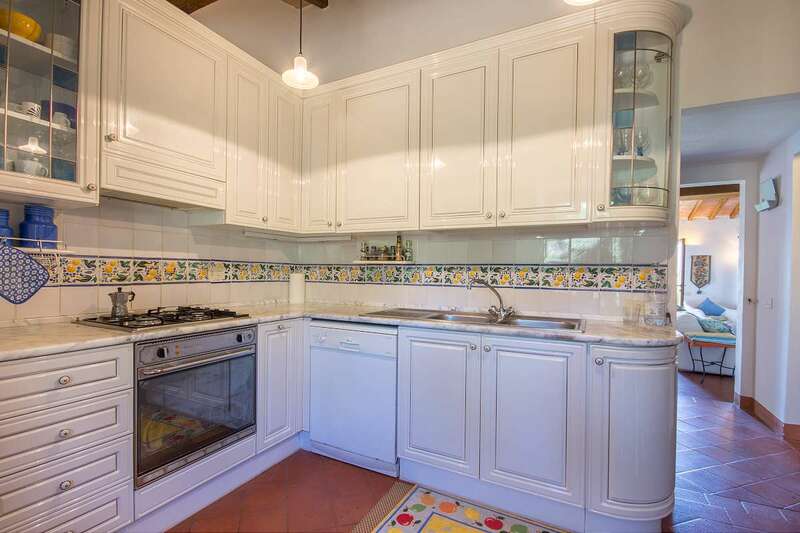 The property comprises a restored 4 bedroom farmhouse and a 3 bedroom cottage annex of 520 sqm in total. 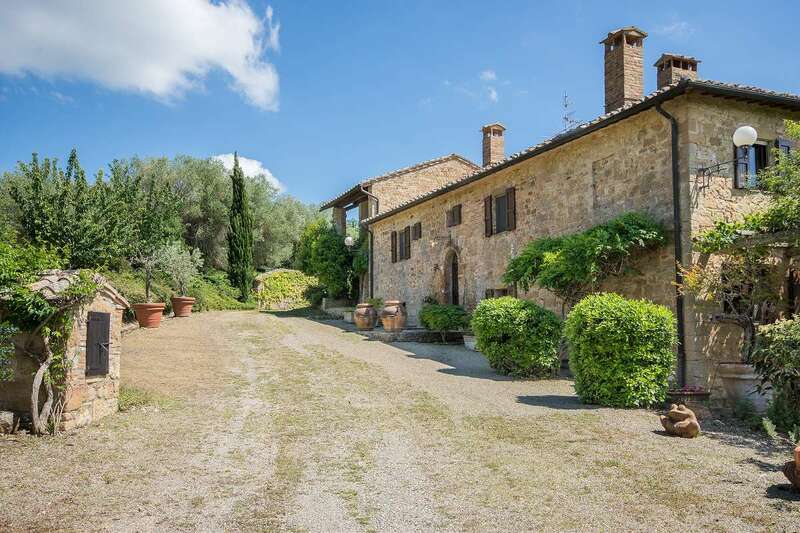 There is a 3 car garage to the rear of the property. 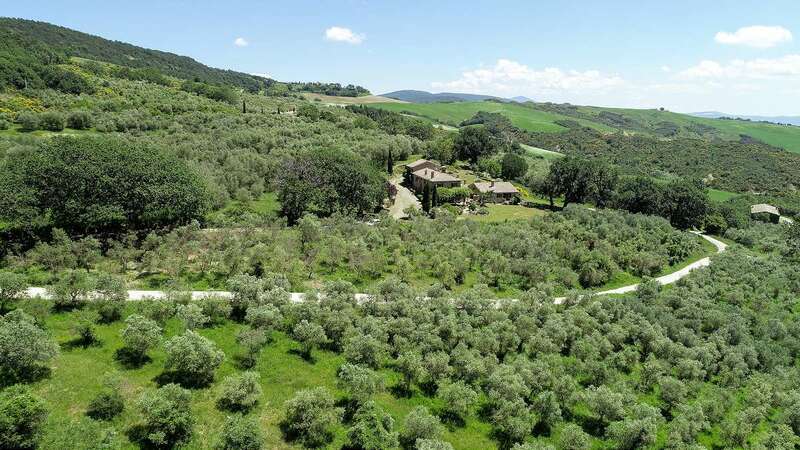 The buildings are set in a hectare of land with a mature garden, ancient oaks and 225 olive trees. 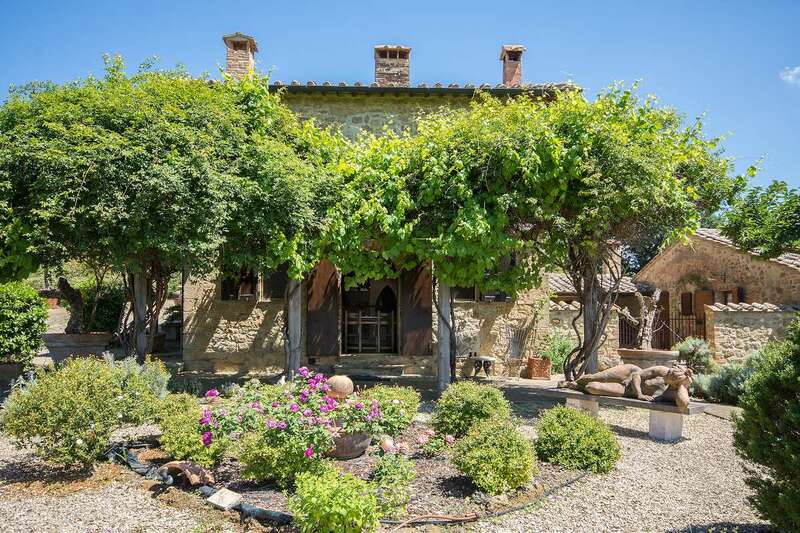 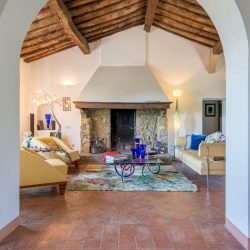 The renovation was carried out in 1990 and the house retains its original wine-cellar and pre-Renaissance column flanking exterior stairs to a centuries-old dovecote, now a bedroom. 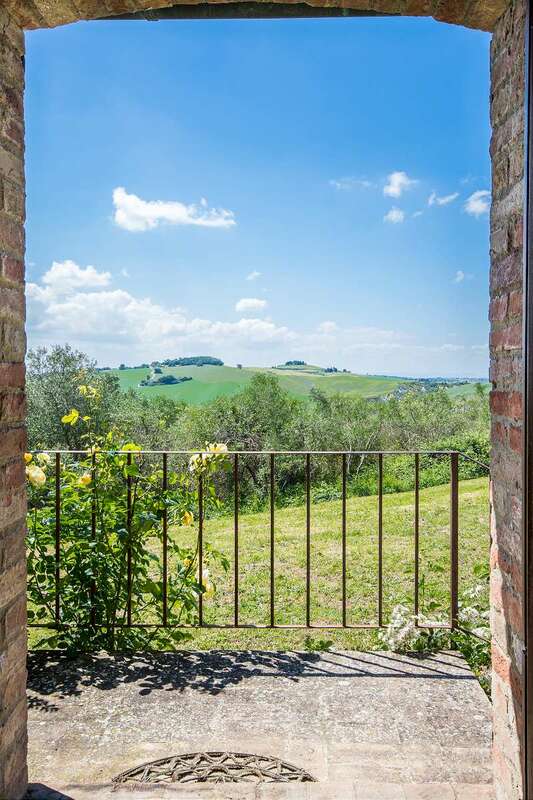 Multiple windows glass doors create a light-filled interior with vistas of the sunsets of Pienza and spectacular views of Radicofani, Mount Amiata, and Castiglione. 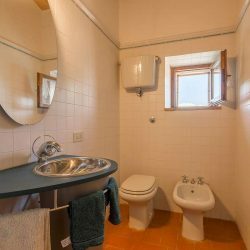 The cottage is comprised of 3 bedrooms, 2 bathrooms, a modern kitchen, living/dining room with a fireplace, and patio. 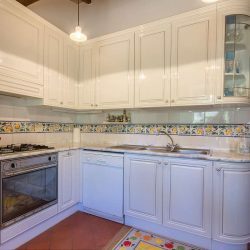 2 bedrooms open up onto a 60 sqm brick courtyard with a built-in pizza oven, laundry and storage rooms. 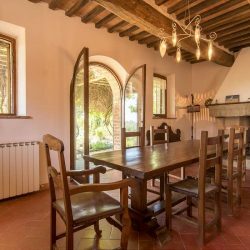 The courtyard adjoins the ground floor of the larger house, framed by a 2 storey pergola, leading through glass arched doors into a spacious dining area with fireplace, professionally equipped kitchen, bathroom, and stairs to the wine cellar. 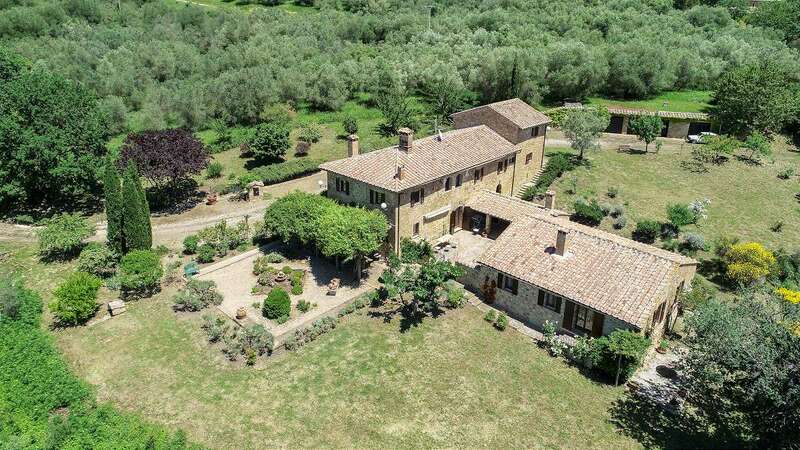 The house’s first floor consists of 3 bathrooms, 3 bedrooms, a living room with fireplace, storage space, and a study/ cinema room, from which stairs lead to the second floor bedroom. 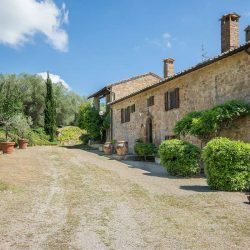 At the rear of the property is a three-car garage. 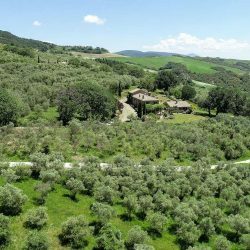 The one hectare of land includes 225 olive trees, ancient oaks, a mature garden of perennials and fruit trees watered by automatic sprinklers. 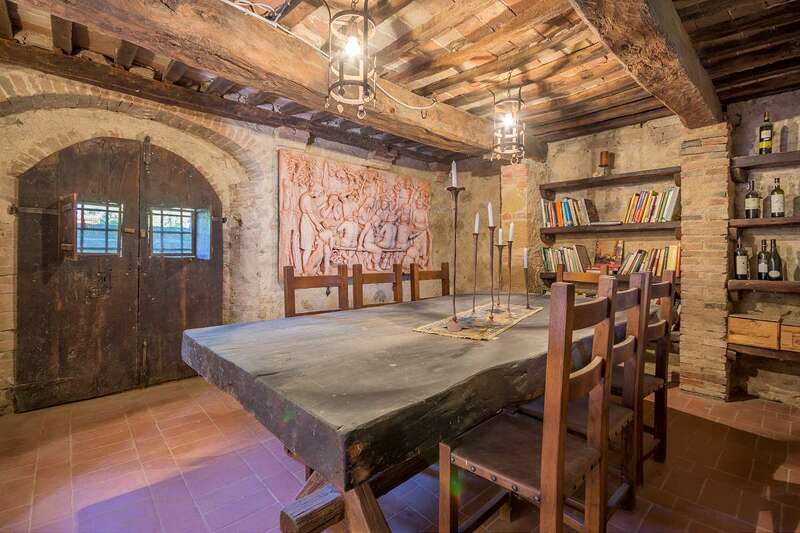 Ground floor: Living room with fireplace, kitchen, bathroom, food storage and wine cellar, study/living room, courtyard. 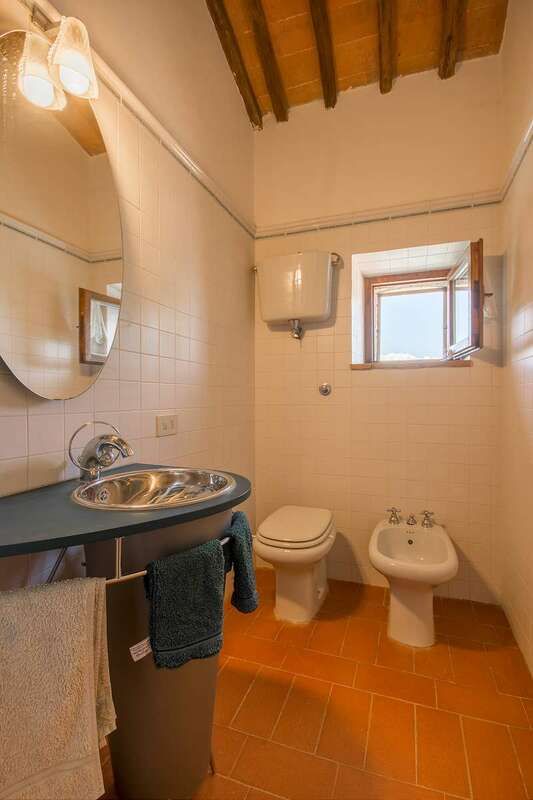 First floor: Living room, study, 3 bedrooms, 3 bathrooms. 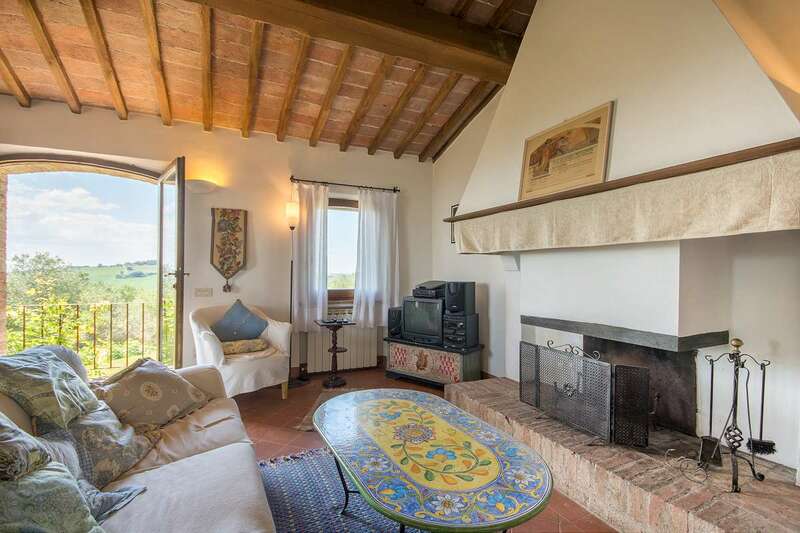 Ground floor: Living room with fireplace, kitchen, 3 bedrooms, 2 bathrooms. 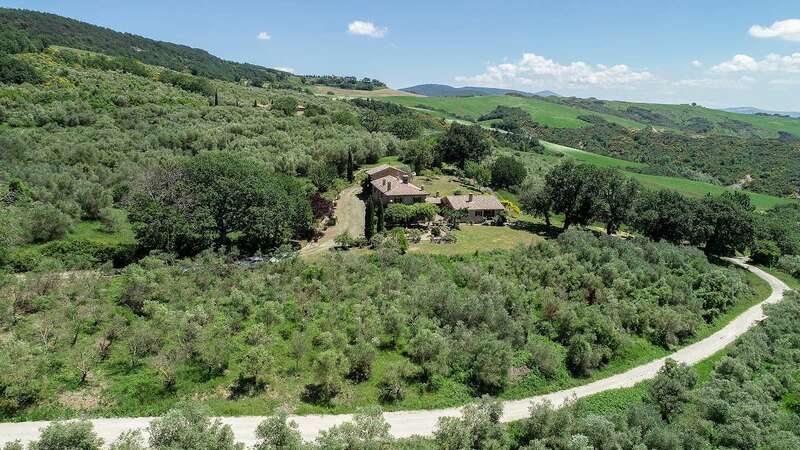 1 hectare of land with an Italian style garden and 225 olive trees. 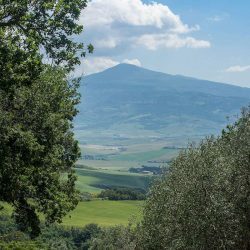 It would be possible to build a pool. 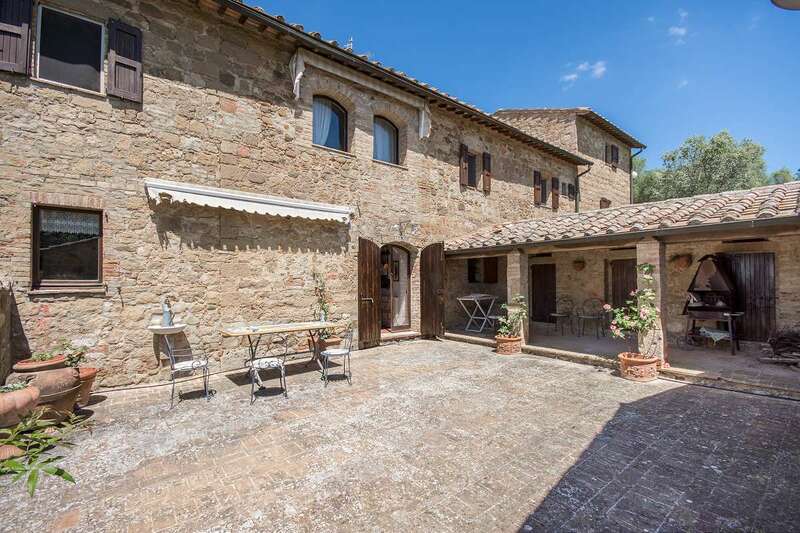 Parking space and 3 garages of approx 100 sqm. 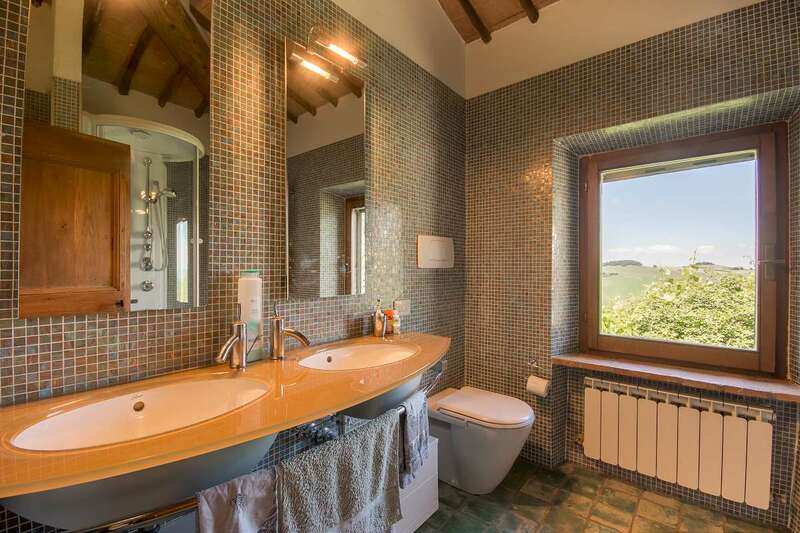 Mains electricity, spring and cistern water, LPG heating , irrigation system, alarm system. 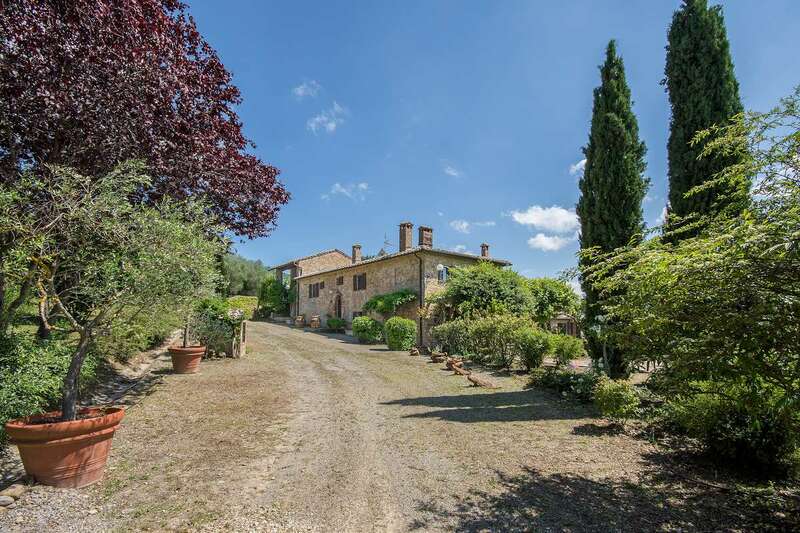 Perugia 91 km, Florence 130 km, Rome 206 km.